Knee arthroscopy is surgery that is done with a tiny camera to see inside your knee. Other instruments are also be inserted to repair your knee. Three different types of anesthesia (pain management) may be used for knee arthroscopy surgery. Your knee will be numbed with painkilling medicine (Lidocaine), and you may be given medicines that relax you. You can stay awake and watch the procedure on the screen or sleep under a light anesthesia and wake up at the end of the procedure. In general I do not use a tourniquet as there is almost no bleeding during the procedure. ACL reconstruction requires a tourniquet. I make 2 small incisions around your knee. Sterile fluid (saline) is pumped into your knee to open up the space. A tiny camera (the size of a pencil) is attached to a video monitor in the operating room. You can also watch the surgery on the monitor, if you want to. 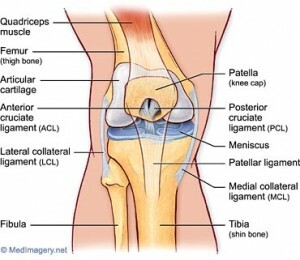 I thoroughly examine every compartment in your knee with the camera and a probe. Then I repair or remove the problem such as a torn meniscus, loose piece of cartilage or torn ligament. I close your incisions with sutures (stitches) that dissolve under the skin and cover them with a dressing. After obtaining your history, I examine your knee to check the range of motion and stability. X-rays help to evaluate bone injury and alignment. An MRI is best used to confirm the preliminary diagnosis and provides an idea of the severity of the injury and the possible damage to the menisci. There are two ramifications of tearing your ACL. First, is the functional stability and consequent athletic disability, and the second is the potential development of articular degeneration and arthritis that can evolve over years. What are the options for treatment of an ACL tear? The options following an ACL tear are based on your personal athletic goals and the timing of your injury care. In order to assure the best outcome, we must work together to determine the level of activity to which you wish to return and the timing of injury care must be matched to your agenda, goals and priorities. Option #1 – Conservative: This is best for those individuals who are lower demand athletes who do not do aggressive and pivoting types of sports. You will need a brace to facilitate a gentle range of motion of your knee and healing of other structures that we call secondary stabilizers. Physical therapy will first help you gain your motion, then strength and agility. The knee is not as stable, and you may need a brace for certain activities. Some people can compensate very well while others cannot tolerate the instability in their knee and eventually chose surgery. Option #2 – Knee Arthroscopy and Meniscus care only: This option can be selected if you have a meniscus tear and do not want ligament reconstruction. At arthroscopy, we look for articular cartilage damage and meniscus and ligament tears. Only the torn part of your meniscus which is already non functional is removed. All of the healthy meniscus is preserved. Meniscus repairs in ACL-deficient knees fail at a higher rate and this is not a recommended option. Postoperatively you will be started in physical therapy a week after surgery. Option #3 – Arthroscopic ACL Reconstruction:This option is preferable for mid and high level recreational, elite and professional athletes. This procedure has evolved over a 20-year period to a level that we are 90-95% successful in returning athletes to sport. The surgery takes an hour to two hours and you can usually go home around an hour or so after the procedure. Subsequently you can engage in an accelerated rehabilitation program. During the surgery, the precise location of the natural ACL is determined and then a graft is placed. There are several options for the graft substitution. Autograft Patellar Tendon – This entails removal of the center of your own patellar tendon with bone blocks on either side. The graft is placed in drill-reamed bone tunnels and secured with Bioabsorbable screws that your body turns into bone 1-2 years following surgery. Anatomic positioning allows for complete functional range of motion. Autograft Semitendinosus – The use of the ‘hamstring muscle’, which includes the semitendinosus and gracilis muscles, has gained increased popularity in the recent years. This technique utilizes these tendons to substitute for the ACL and is held with screws or specialized buttons. This is an excellent technique but athletes who use their hamstring tendons are often reluctant to use this tissue as here can be some slight weakness in knee flexion. Previously, the allografts were treated with chemicals such as ethylene oxide that damaged the graft and host tissues. Radiation was used in the past which damaged the graft and caused loosening over time. In recent years the allografts have used new processes which do not degrade the graft. These advances have facilitated widespread use. Anytime the concept of allograft or human transplantation is discussed it is imperative to understand the probability of HIV and hepatitis transmission. To date, all specimens are comprehensively screened and negative results are documented. The accepted probability for these virus infections is 1 in 1 million. Risks of anesthesia – As a general rule all anesthesia options are safe and effective. Regardless of the option selected, complication rates are generally low. The most important issue is making sure that you are healthy and there are no underlying medical conditions that can influence this. In many situations you will be asked to see your general physician for a preoperative history and physical exam to define these potential issues. Infection – Probability approximately 1/200-300. To minimize this risk you will receive pre and postoperative antibiotics. Recurrent laxity and graft failure – 2-5/100. Re-operation – 5/100. For any reason, which can include pain, decreased range of motion, infection and/or instability problems. Nerve and/or blood vessel injury – 1/500. Deep vein thrombosis or blood clots – 1/500. When should I schedule surgery? The elite, high level or professional athlete. It is in this group that the time from injury to full return is vitally important. In the situation where there is a displaced meniscus tear that won’t allow free range of motion. Each knee has two C-Shaped menisci that sit on the surfaces of the tibia (shin bone). The menisci increase the surface area of contact and fill the gaps between differently shaped articulating surfaces: the round femoral condyles, the relatively flat tibial plateau on the medial side, and the convex tibial plateau on the lateral side. The menisci are unique in shape, design and purpose. The “C” shape corresponds to the surface of the femur and the wedge shape provides additional stability the knee. The menisci distribute load and provide additional stability for the knee. The meniscus plays a role in load transmission across the knee joint. A proposed function of the meniscus is that of shock absorption. The menisci may provide a mechanism for joint position sense (proprioception). The menisci are resilient structures, but only have blood supply in the outer third. A meniscal tear is one of the most common injuries. Meniscus tears are very common. Turning or twisting of the knee may cause tearing of the meniscus. Flexion and extension of the knee can displace the fragment out its normal position. Symptoms of a meniscus tear can include: swelling, pain, clicking, catching, popping or snapping. A knee effusion (swelling) may or may not be present. Mensicus tears are “consistently inconsistent” in nature. That is, the tear may be bothersome or painful at times while other times or with other activities, you may not even know or feel that you have a tear. Moreover, there is no way of knowing when, if, for how long, it will be painful or bothersome. Giving way and locking are also frequent symptoms of a meniscal injury. Displaced “bucket-handle” tears, which usually go with ACL deficiency, can cause the knee to lock in flexion. How is a meniscus tear evaluated? Accurate diagnosis starts with the history of injury and the physical examination. During your visit, I will ask a series of questions to get an idea of how your injury occurred and what symptoms you are experiencing. We will then perform specific tests to try and determine the diagnosis. An MRI may be ordered. Early clinical and MRI diagnosis, and appropriate treatment of meniscal tears, especially in people younger than 40, are very important for the longevity of the knee joint. The majority of the time tears of the meniscus need to be taken care of surgically. This is due to the fact that the meniscus has a very limited blood supply. Only the outside one-third of the meniscus is supplied with blood. This is considered the red zone. Tears in this area can heal if repaired. 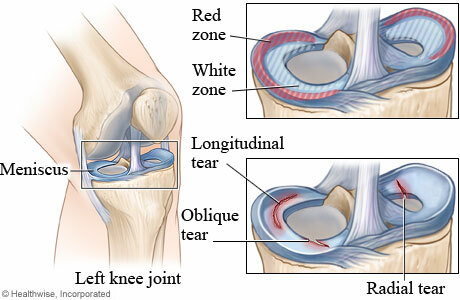 The inner one-third of the meniscus (white zone) is not supplied with blood and tears in this area will not heal. If you have a meniscal tear (typically a displaceable flap tear of either meniscus) which is causing you mechanical problems (clicking, catching, locking, etc. ), careful arthroscopic partial meniscectomy is often the quickest way to solve this problem and restore knee function. Losing a small, already torn, part of the meniscus is not a major problem in the long run, provided the knee is stable and that articulating surfaces are not worn out. However, complex meniscal tears are often associated with unstable ligaments and damaged articular surfaces; surgical removal of most of the meniscal tissue, therefore, is associated with accelerated wear and tear. The part of the meniscus that is torn is not functional. Removing the already torn part does not further remove any function from the knee nor does removal accelerate wear and tear in the knee. When someone tears their meniscus, ACL, and MCL at the same time it is known as the unhappy triad. An unhappy triad normally is treated with surgery and the most difficult injury in the unhappy triad is the ACL tear. Surgical treatment of meniscal tears involves an arthroscopic procedure. I insert a small camera and instruments into the joint, performing the procedure through 2 small incisions. Depending on the location and type of tear, I repair or remove the damaged area. Removal of the involved area is known as a partial meniscectomy. The goal is to leave as much of the healthy meniscal tissue as possible while recontouring the meniscus to reduce the possibility of a future tear in the area. There are times it is possible to repair the meniscus with sutures. Only about 5% of tears are suitable for repair. It is important not to attempt a repair in an unsuitable meniscus as these will likely fail and require another surgery along with a longer recovery process. Partial menisectomy is performed if the meniscus tear is not amenable to suture or other methods of repair. These procedures involve removing the unstable fragments of meniscus and re-contouring the meniscus structure so it can distribute forces rather than concentrate forces only. It does not include removal of the complete meniscus my goal is preservation of whatever part is possible. The patella, also known as the knee cap articulates with the femur and covers and protects the knee joint. It can become irritated or injured from prolonged sitting, overuse, misalignment or instability. The patella can also fracture, which may involve a single crack or shattering into several pieces. How are patella problems treated? Temporarily resting the knee and taking nonsteroidal anti-inflammatory drugs (NSAIDs) such as ibuprofen, naproxen, or aspirin may help relieve pain. Physical therapy, especially quadriceps strengthening and hamstring stretching, may be helpful. Limit participation in sports or strenuous activity until the pain has gone away. Avoid activities that increase the pain, such as deep knee bends. If the alignment of the patella cannot be corrected with therapy, surgery may be an option. Depending on the type of misalignment, the surgery may be arthroscopic (using a camera, which allows a smaller incision) or open. These fractures are serious injuries and often require surgery. They usually result from direct impact to the knee cap itself from a fall or a car accident. The patella is a small bone located in front of your knee joint — where the thighbone (femur) and shinbone (tibia) meet. 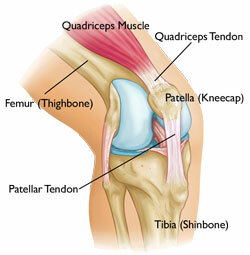 The patella helps your quadriceps muscle extend your knee. What are the types of patellar fractures? Patellar fractures vary tremendously. The kneecap can crack just slightly, or can be broken into many pieces. 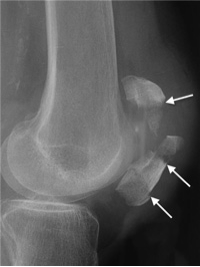 This x-ray of the knee taken from the side shows a patella that has been fractured in three places. Stable fracture: This type of fracture allows you to fully extend your knee. The broken ends of the bones are aligned. Sometime this can be treated in a cast and then a brace without surgery. Displaced fracture: When a bone breaks and is displaced, the broken ends are separated. You are unable to fully extend your knee. This type of fracture often requires surgery. How is a patella injury evaluated? I use xrays and fluoroscopy to determine the type of fracture and treatment needed. Sometimes a CT scan or MRI will be needed to rule out other associated injuries. Although uncommon, a person may have bones in the patella that have not grown together. This is called “bipartite” patella and may be mistaken for a fracture. Many people have bipartite patella in both knees, so I may take an x-ray of your other knee, as well. 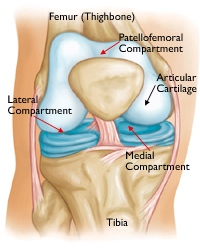 If the patella has displaced you will likely need surgery. Your thigh muscles that attach to the top of the patella pull the broken pieces out of place during healing. Surgery consists of using a combination of metal implants, wires and sutures depending on the type of fracture. These implants are close to the skin because no muscle sits directly over your knee. I remove these a year later (when the bone is well healed) if they irritate your knee. Surgery generally takes about an hour and you can usually go home the same day. With a hinged brace you can walk after a week with crutches. The patella takes a long time to heal and recovery involves rehabilitation to regain your knee range of motion and strength. A fracture, or break, in the bone of the upper part of the lower leg (tibia, or shin bone) may result from a low-energy injury, such as a fall from a height, or from a high-energy injury, such as a motor vehicle accident. Proper identification and management of these injuries will help to restore limb function (strength, motion, and stability) and lessen the risk of arthritis. The soft tissues (skin, muscle, nerves, blood vessels, and ligaments) also may be injured at the time of the fracture. Because of this, the orthopedic surgeon will also look for any signs of soft-tissue damage and include this in plans for managing the fracture. Whether the injury is treated with surgery or without, both the bony injury (fracture) and any soft-tissue injuries must be treated together. Knee joint replacement is surgery to replace a knee joint with an artificial joint. The artificial joint is called a prosthesis. Move your kneecap (patella) out of the way, then resurface the ends of your thigh bone (femur) and shin (tibia) bone to fit the prosthesis. The kneecap is resurfaced as well. Fasten the two parts of the prosthesis to your bones with special bone cement. One part will be attached to the end of your thigh bone and the other part will be attached to your shin bone. A special plastic spacer acts at the joint between the surfaces. Why replace just one part of the knee? The answer is that this procedure is must less invasive and an easier recovery. The knee keeps all of its ligaments, and moves and works very much like your own knee but with less pain. The goal of knee replacement surgery is to decrease pain and restore function. Although total knee replacement (arthroplasty) is an excellent option for patients with osteoarthritis of the knee, less invasive surgical options exist. Patients with osteoarthritis in just one part of the knee may be candidates for unicompartmental knee replacement. 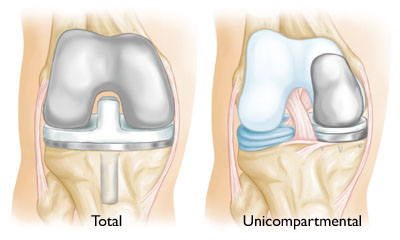 Unicompartmental knee replacement is an option for a certain percentage of patients. If your arthritis is confined to a single part (compartment) of your knee you may be a candidate. 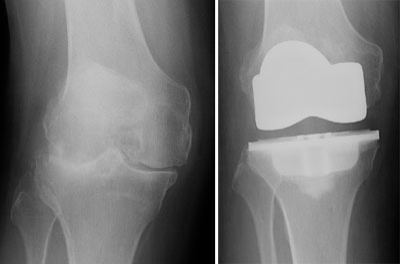 In a unicompartmental knee replacement, only the damaged compartment is resurfaced with metal and plastic. 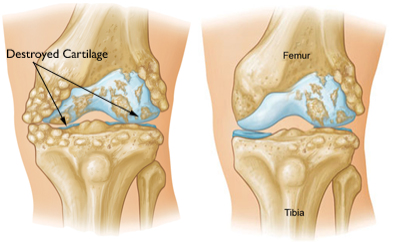 The healthy cartilage and bone in the rest of the knee is left alone. A normal knee joint: The medial, lateral, and patellofemoral compartments are shown with red arrows. A unicompartmental knee replacement feels more “natural” than a total knee replacement. A unicompartmental knee may also bend better. The disadvantages of partial knee replacement compared with total knee replacement include slightly less predictable pain relief, and the potential need for more surgery. For example, a total knee replacement may be necessary in the future if arthritis develops in the parts of the knee that have not been replaced. Most often there is some wear and tear in the compartments that are not replaced and mild soreness may be present. However, most patients would rather have mild soreness than replace their entire knee. I may recommend surgery if you have more advanced osteoarthritis and have exhausted the nonsurgical treatment options. Surgery should be considered if your knee is affecting the quality of your life and interfering with your normal activities. In order to be a candidate for unicompartmental knee replacement, your osteoarthritis must be limited to one compartment of your knee. About 7 out of 100 patients with arthritic knees are good candidates for unicompartmental knee replacement. Xrays, MRI and even arthroscopy are possible ways of evaluating the knee for suitability for this surgery. The location of your pain is very important when deciding on the type of surgery. If your pain is located almost entirely on either the inside portion or outside portion of your knee, then you may be a candidate for a partial knee replacement. If you have pain throughout your entire knee or pain in the front of your knee (under your kneecap) you may be better qualified for a total knee replacement. You will be admitted to the hospital on the day of surgery. Before your procedure, a doctor from the anesthesia department will evaluate you. Anesthesia can be either general (you are put to sleep) or spinal (you are awake but your body is numb from the waist down). I will also see you before surgery and sign your knee to verify the surgical site. A partial knee replacement operation lasts between 1 and 2 hours. I make an incision at the front of your knee and verify that the cartilage damage is, in fact, limited to one compartment and that your ligaments are intact. If your knee is unsuitable for a partial knee replacement, I then perform a total knee replacement. We must have this contingency plan before your operation. If your knee is suitable I remove the remaining cartilage surface from the damaged compartment of your knee and will cover the ends of the femur and tibia with metal coverings. The metal components are held to the bone with cement. A special type of plastic insert is placed between the two metal components to allow for a smooth gliding surface. As with any surgical procedure, there are risks involved with partial knee replacement. Blood clots. Blood clots in the leg veins are the most common complication of knee replacement surgery. Blood clots can form in the deep veins of the legs or pelvis after surgery. Blood thinners such as low-molecular-weight heparin, aspirin, or other drugs can help prevent this problem. Because a partial knee replacement is done through a smaller, less invasive incision, hospitalization is shorter, and rehabilitation and return to normal activities is faster. Typically you spend 1 night in the hospital. Patients usually experience less postoperative pain, less swelling, and have easier rehabilitation than patients undergoing total knee replacement. A physical therapist will help you maintain your range of motion and restore your strength. You will most likely resume your regular activities of daily living by 6 weeks after surgery. 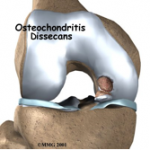 Treatment of osteoarthritis of the knee aims to relieve pain. Ibuprofen or nonsteroidal anti-inflammatory drugs (NSAIDs) are used, along with physical therapy, applications of a topical analgesic and injections of a corticosteroid. However, some people have a reaction to NSAIDs and these agents usually bring only temporary relief. A relatively new procedure, called viscosupplementation, injects a lubricant gel of hyaluronic acid into the knee joint. Hyaluronic acid is a naturally occurring substance found in the joint fluid. As a lubricant it helps bones move smoothly over each other and as a shock absorber for joint loads. Effects of Viscosupplementation: Viscosupplementation has been shown to relieve pain in many patients who cannot get relief from nonmedicinal measures or analgesic drugs. The technique has been used in Europe and Asia for years, but the U.S. Food and Drug Administration did not approve it until 1997, and then only for treating osteoarthritis of the knee. Several preparations of hyaluronic acid are now commercially available. I typically do not use Synvisc as a few patients have had swelling from this brand of injection. Immediate Effects: Hyaluronic acid does not have an immediate pain-relieving effect. You may notice mild pain, warmth, and swelling immediately after the shot. These symptoms generally do not last long. Apply an ice pack to help ease them. For the first 48 hours after the shot, you must avoid excessive weightbearing on the leg, such as standing for long periods, jogging or heavy lifting. Longer Term Effects: Over the course of the injections, you should notice that you have less pain in your knee. Hyaluronic acid seems to have anti-inflammatory and pain-relieving properties. The injections may also stimulate the body to produce more of its own hyaluronic acid. Treatment:If there is any swelling in the knee, I remove the excess fluids before injecting the hyaluronic acid. Only one needle is injected into the joint for the entire procedure. You will receive a weekly shot for a 3 week period. Outcome: Viscosupplementation can be helpful for people whose arthritis has not responded to basic treatments. After knee arthroscopy when significant cartilage damage is found it can help your long-term recovery. It is most effective if the arthritis is in its early stages (mild to moderate). The long-term efficacy of viscosupplementation is not yet known and research continues in this area. Patients who get a great result from the injections may wish to repeat the series every 6-12 months. If your arthritis is not responding well and you feel the shots are not effective we do not repeat the series and have to consider other treatments such as more therapy, PRP, arthroscopy, partial or total knee replacement. What types of cartilage lesions are there and how can they be treated? Partial Thickness Defects: Partial thickness articular cartilage defects are treated with debridement, which means smoothing it down. Microfracture: This technique places small holes in the exposed bone to stimulate a healing response of the marrow that includes the “mesenchymal stem cell.” In approximately 80% of these defects, there is some degree of healing with repair cartilage that is not as good as the original, but may be satisfactory. This considered the first line of repair. The major downside is that it requires you to be on crutches for 4-6 weeks as the repair cartilage forms. During this healing phase you will be asked to bike and swim after the first 10 days. If we find a full thickness defect that is very large or one that has not healed to our or your satisfaction then secondary methods (to be done at a later date) may be initiated. 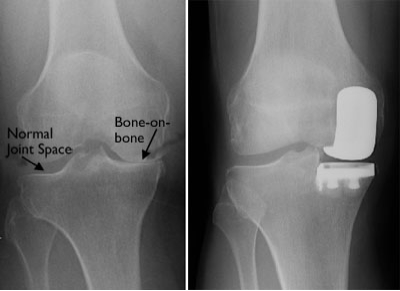 Osteochondral Grafting: This technique commonly involves taking plugs of bone and cartilage from non-weight bearing portions of the knee and transferring them to fill the defect and resurface this affected area. This is a technique which requires subspecialty training in sports medicine. I have extensive experience with this technique. Autologous Chondrocyte Implantation: This is a relatively new technique of repair that takes a biopsy of your articular cartilage which is then used to clone your chondrocytes (the cells that make articular cartilage). Approximately 12 million new chondrocytes are created and in a month or more are placed back into the defect under a periosteum patch which is a thin lining of bone tissue. This technique has been used to resurface large defects and is very good for selective situations and patients. People with osteoarthritis are not candidates for this procedure. DeNovo NT (Natural Tissue Graft): This is a very new technology using cartilage stem cells from donors. There is no need for a patch and no need to open the knee. This can be done arthroscopically.